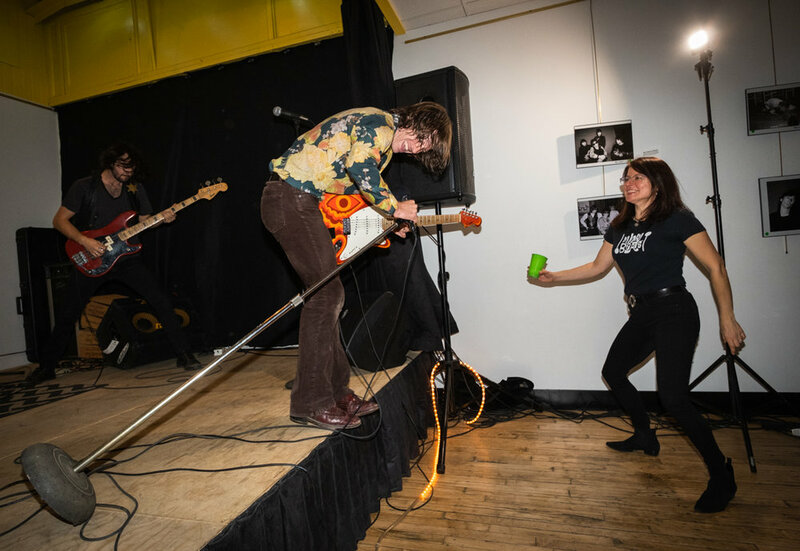 Photographing The Schzophonics, the most recent concert at GetHip Recordings, presented a severe dilemma, how to freeze the band's lead singer who never stopped moving. The frenetic energy he displayed, if harnessed, could have powered a small city for days. He twisted, turned, jumped, rolled, leaped off stage, and dashed back and forth non-stop for the entire performance. Typically, I shoot concerts by available light. I prefer this so I can make many exposures and not bother the performers or the audience. Some venues insist on it. Luckily, for this concert, I was warned of the intensity I would face, so I knew shooting at 1/125 (my standard shutter speed) was never going to stop the action. Because of that, I brought a small flash, specifically, a Godox V350f. This tiny flash is a perfect fit for my Fujifilm XT-3 bodies. Armed with a flash, I set my ISO to 3200, aperture to around f/4, and shutter speed at 1/125 or 1/60. These settings allowed me to stop the action with the flash, but still let in some available light. Because the singer was all over the stage, from a few inches in front of me and beyond, I settled on my 12mm Zeiss. I knew the quality of my Fuji files would be clean and tight at 3200 so I wasn't worried if I need to crop I could. I also knew the face recognition feature on the XT-3, plus continuous autofocus would keep the singer razor-sharp no matter where he was at any time. As long as I could keep him framed as he dashed back and forth, I would be fine. One surprise that was very welcome was how well the small Godox V350f covered the 12mm without a diffuser. Most units I've used max out around 16mm (24mm in full frame speak) unless you put a wide-angle filter on the flash. The Godox spread the light right to the edges of my frame. Yes, there was some slight vignetting (maybe 1/2 stop), but nothing more than I would have commonly added myself in post-production. Plus, because of the unusually high ISO my recycle time was almost instantaneous and the flash duration was extremely high. The upper limit of the V350f flash duration is 1/20,000 second. Whatever it was, it stopped every hair and bead of sweat that was flying, along with jumps, dives, and rolls about the stage. While I often convert concert photos to black and white, I do so because that's how the pictures speak to me. These images screamed for color from the first frame to the last. Maybe it was the energy, or the directness of the flash, or the colors within the photos (lots of warm tones). Whatever it was I knew, these spoke to me the loudest in the full glory of color. Just like music, you have to hear and feel the message the photo is telling you. Rock on!